Late last night — or early this morning, depending on how you want to look at it — some seismic news shook the Cincinnati soccer scene. As revealed by good friend Chad Hollingsworth from Scratching the Pitch, full-fledged professional soccer would be returning to the Queen City in the form of a new USL franchise. No, this isn’t the long rumored move of the Dayton Dutch Lions to Cincinnati. Nor is it the USL PDL’s Cincinnati Dutch Lions stepping up a level in the ladder, either. I’ve also received confirmation that there is zero involvement from the already established Cincinnati Saints of the NPSL. This is a brand, spanking new club — admittedly with some loose ties to the Dutch Lions organization. So who is this new club, where did they come from, and how this all come to be? Word of a new USL franchise first came across my desk back in December of 2014, and I’ve been chasing information on it ever since. Admittedly, extruding any sort of information on the topic proved extremely difficult. Wrong paths were followed. Dead ends were discovered. Red herrings were hooked. But the wet weather of the last month has finally yielded spring flowers. Let’s start with what we already know. As Chad disclosed, the new Cincinnati USL club will be feature an ownership group fronted by Jeff Berding. He’s spent the last 17 years working for the NFL’s Cincinnati Bengals, currently holding the title of Director of Sales and Public Affairs. Jeff’s ties to Cincinnati run deeper than just his role with the Bengals. He attended the same high school as myself, graduating from Cincinnati St. Xavier in 1985. Afterward, he attended Xavier University. Berding also spent nearly five years as an elected official, serving as a Cincinnati City Councilman from 2005 to 20011. As for his ties to soccer, Mr. Berding currently serves as the President of the Board of Directors of local youth soccer power, Kings-Hammer FC. For those who have followed the USL for some time, that club name may ring a very interesting bell. 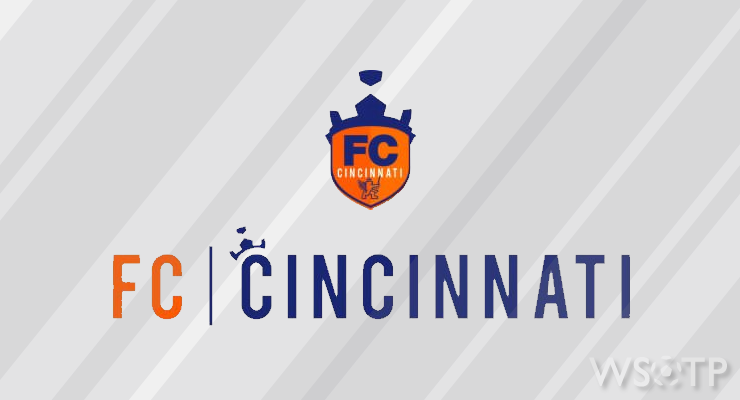 It’s the lovechild of a “joint-venture” between local youth side Hammer FC and former local USL Second Division franchise, the Cincinnati Kings. While that professional club may have gone belly up in 2009, the youth club has continued to thrive. Additionally, Berding’s LinkedIn profile indicated he’s also spent a spell on the sidelines as a youth coach for local parochial school St. Ursula Villa, too. Also mentioned in the Scratching the Pitch article was another interesting soccer relationship: Berding served on the board of the Cincinnati Dutch Lions. More on that later. While my sources confirmed the exact same information as what Chad wrote, aside from knowing that the team plans to begin play in Spring of 2016, that’s all we knew definitively about the prospects of USL coming to Cincinnati. That wasn’t enough for me. So I, along with WSOTP Podcast partner Jeremy Lance, dug a bit deeper. The first thing uncovered: two branded Twitter profiles that neither followed anyone nor had any followers themselves. 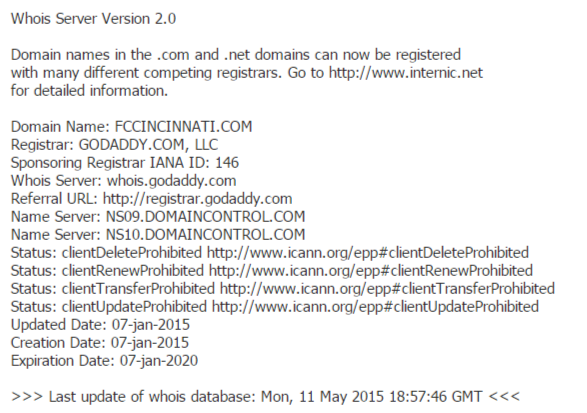 Next was to search web domain registries, where we found a matching URL that had been purchased in January of this year. 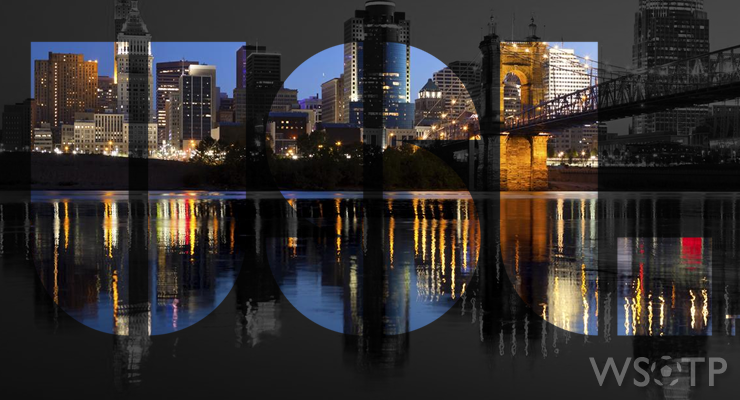 The site, however, was blank other than an email sign up for more news and a banner of “Coming to Cincinnati Soon”. But neither of those could be tied back to Berding, the Dutch Lions, or Kings-Hammer. And I needed something that could. Luckily, we hit gold with United States Patent and Trademark Office. FC Cincinnati. Plain and simple. It won’t turn off most general American sports fans, and will appease some of the more Euro-centric ones too. Not exactly original, but I can deal. But an orange and blue crest, prominently featuring a lion? That seems awfully Dutch Lions-ish, doesn’t it? And besides, none of that still directly ties any of this back to Berding, the Dutch Lions, or Kings-Hammer. Until I saw the lawyer who filed it. The attorney of record on both trademark filings was an Otis W. Grigsby, of local law firm Taft. And it just so happens that Grigsby, is a former NFL player. Ding! Ding! Ding!!! Sure, it’s a bit of a leap. But not a very big one. You have to admit that Grigsby’s ties to the NFL provides a nice loop back around to Berding. EDIT 6/2/2015: The domain registration mentioned above actually provides a much stronger link to Berding than originally thought. The registration itself was to a Gary De Jesus, who runs a local brand development company called YBG Ventures and also sat on the board of directors at Kings Hammer with Berding. Direct link achieved. And once with that final puzzle piece in hand, the bigger picture suddenly fell into focus. What follows: pure speculation. But to me at least, it makes a lot sense. Berding’s employment with the Bengals gives us a man who has extensive experience working in professional sports. The Bengals link also leads to what is unquestionably a soccer logo, trademarked for soccer uses within the last month. A matching Twitter handle and URL also recently popped up. A strong case can be made for an impending franchise announcement, especially with less than a year to run until 2016 USL season kicks off. But what about Berding’s ties to both Kings-Hammer FC and the Dayton Dutch Lions? How do those play in? The Dutch Lions had long coveted and been speculated as the next Cincinnati USL side. Club management admitted as much when they founded the Cincinnati Dutch Lions in PDL. And remember that Berding sits on that Dutch Lions club’s board. But due to a number of factors — including never actually securing the more lucrative USL franchise rights from the Kings — it never worked out. The “Dutch Lions” brand never really resonated within the community, and the PDL team never managed to get much of a foothold either. If a USL franchise were to take up residence in the Tri-State, a new identity would need to be forged. That’s where Kings-Hammer comes in. Again speculating heavily, could it be that the Kings — and by extension Kings-Hammer FC — still own the USL rights for the Cincinnati metro area? Could Abdallahi be one of the other investors? With Berding serving as the club’s current board president, that would potentially put him in control of those franchise rights if Abdallahi passed them on. Could this be the marriage between a Kings organization and a Dutch Lions organization that could never before hammer out a deal between them? As usual, USL’s official response was to not respond to ownership and franchise rights speculation. It makes sense on a lot of levels. All of the pieces neatly tie together — Berding, the Bengals, the Dutch Lions, and Kings-Hammer FC. Keeping the branding similar to that of the Dutch Lions organization might also hint at a potential partnership, including speculated further investors like Dayton Dutch Lions backer Dr. Suresh Gupta. And the crown on the new logo might also be a homage to the Kings, who’s old crest also featured a lion. Obviously, lots still needs to be settled before we can call all of this a 100% sure thing, and key questions remain to be answered. Deeper pockets are still needed to meet current and potentially future USL ownership requirements, and outside of Berding, we still haven’t nailed down who the other investors actually are. Where exactly will this team be playing? How will Cincinnati handle yet another fracturing in professional soccer interest in the city? And with less than a calendar year to go until the rumored 2016 launch, when exactly are we going to get an official announcement from the league and team? That’s a lot of if’s that aren’t yet settled, so a grain of salt is a necessity at this point. But if I were a betting man, I’d be putting a whole lot of money down on USL and FC Cincinnati. When can we expect there to be more information brought public about FC Cincinnati? Like where they’ll play, who are all the people running this club, and who will be playing for the team. I’m just as curious as everyone else just want to know when to expect further information from usl or the owners.